The Panoramic View from the top of Angels Landing in Zion National Park. The chains leading up to Angels Landing both scare and excite the average hiker. However there is nothing average about Angels Landing. It is one of the most amazing experiences I have ever had and I believe one of the top 10 day hikes in America. Some may say it is the most iconic day hike in America! It comes with precaution though...numerous people have died on this trail in recent years and I would say you would only consider this hike with 0% chance of rain/bad weather that day and you are a seasoned and experienced hiker who has ZERO fear of heights. 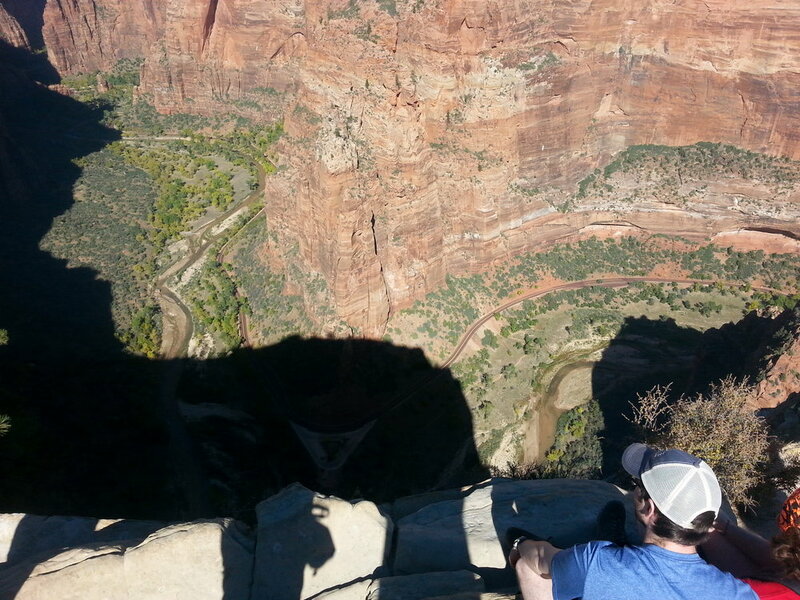 Angels Landing is also not the place to test to see if that old fear of heights still exists! I caught the Springdale shuttle into Zion and walked in to grab the Zion Canyon Shuttle at the Visitor Center, it's really slick and easy to use! Now on to the fun part...I hiked Angels Landing last fall and it was a truly memorable experience and I felt safe enough with the chains that I would hike it again. I would not recommend taking children under the age of 13 or so...but that is just my personal opinion. However many did just that and the children were safe and smart. While many people have died on this trail it is not even the most dangerous hike in Zion. But it gets a lot of controversy surrounding it due to the chains. On to the hike! 5.2 Miles RT with 1,500 feet of elevation gain. I only had the opportunity to go on a Friday afternoon but I would definitely recommend doing this in the morning due to the traffic on the trail and the sun. There were long backups along the one way portions of the chains. It starts from the Grotto Shuttle drop off in Zion Canyon and weaves its way up for the first two miles with decent elevation but a paved trail. I saw the ever elusive California Condor perched right before the chains started. Now you ask about the chains?? What does that mean Mike R? It means that two miles into the 2.6 one way portion of the hike the trail scoots up the side of the wall rock with massive drop offs on both sides. Seriously i don't know of another "mainstream" hike with this type of finish to it that so many people attempt. Here's a little pic to see what you are working with in a safe spot, I kept my camera away for the "dicey" spots to stay on point. Up up you go while holding on to the chains for .6 miles each way to reach the perch of Angels Landing! Take a look at the final portion of the trail to the top of Angels Landing! Here are some additional pics from the top! Overall if you are a seasoned hiker, not scared of heights, and the weather is nice I would say give it a shot. Be smart and careful and happy trails! It took me about 2.5 hours RT to complete the hike but most of that was the waiting for groups coming and going on the chains. It's a steep climb in elevation before the chains so make sure you pack sunscreen, plenty of water, and sunglasses! As for lodging...same rules apply as my Zion Narrows post. If you have never been to Zion it's one of my favorite places on the planet. I highly recommend you plan a trip, it's only a 2.5 hour drive from Las Vegas Int'l Airport! Have questions or comments about the Angels Landing Hike? Put them below!